Samantha Logan as Olivia Baker in All American. 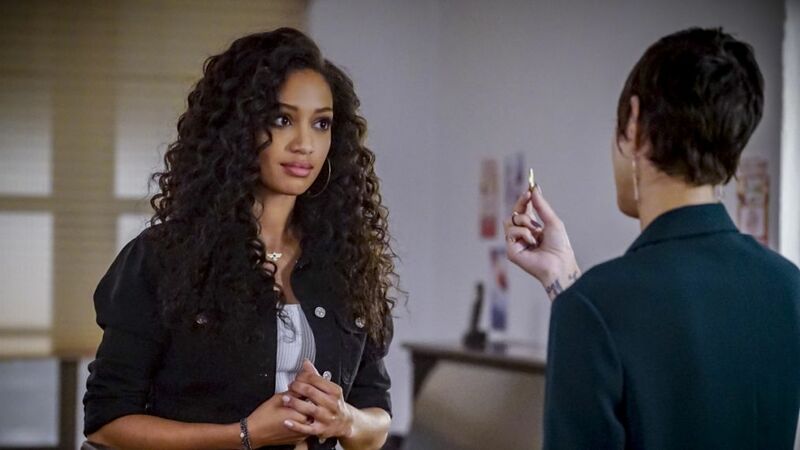 All good wishes aside, as we saw in tonight's episode of the CW drama All American, the sobriety of teenager Olivia (Samantha Logan) came into jeopardy this week when the young woman, just before her one-year anniversary of being sober, finds a forgotten bottle of pills in her bedroom. As she feels isolated from her busy family — who haven't acknowledged her milestone — Olivia is definitely tempted to make the emotional pain go away with a few pills. Also in the episode, the relationship between Spencer (Daniel Ezra) and Layla (Greta Onieogou) hits some rough patches. Meanwhile, Spencer's BFF, Coop (Bre-Z), gets an unexpected jolt when her father reaches out to her and urges her to come home, claiming her mother is ready to accept the young lesbian for who she really is. Of course, things don't go as well as one might think. TV Insider spoke with executive producer and showrunner Nkechi Okoro Carroll to talk the various storylines and get some teases on where things go next. The actress also dished on what's going on in Olivia's head these days and why she's keeping the secret about Asher. This episode really answers a lot of the questions we've had since the pilot about things we've heard about but not seen. Why was now the right time to open that door to the past? Nkechi Okoro Carroll: We felt like now everyone has a good sense of who these characters are, especially Spencer and Olivia. So much of who they are comes from what they've lived through. We didn't want to just talk about it. We felt our audience deserved to really see what they were both like in the past, what demons they overcame, to fully understand them now. The one-year anniversary for Olivia's sobriety is huge for her. I was worried she would backslide given how she was feeling low. Did you and the writers toy with the idea of having her backslide? We toyed with a lot of options in the writer's room. Ultimately, we felt this was the best way to tell the story. Addiction is a constant battle, one Olivia fights every day. We wanted to show the truth of that struggle. Some days you win and some days you don't. We decided today was a day Olivia would win. Daniel Ezra as Spencer and Greta Onieogou as Layla in All American. The past timeline with Spencer is also indicative of how Spencer ended up in Beverly Hills — why was this the right time to give us this backstory of seeing Grace (Monet Mazur) call Billy (Taye Diggs)? The minute we decided to do Olivia's backstory we knew we wanted to do Spencer's, too. It felt right to thematically delve into what the worst day of both their lives looked like and how the decisions people made on that day shaped both Spencer and Olivia's lives and set them on the collision course they're on today. In the pilot, Grace talks about how back then Spencer was in and out of trouble. We really wanted to explore what that version of Spencer looked like and why. Layla and Spencer cant seem to stay in a good place for long. Why doesn't Spencer trust her? Spencer has issues with trust period, because of his father abandoning him. Those issues are manifesting in his relationship with Layla because he's falling in love and that's the most vulnerable, shaky ground for him. Coop even calls him on the fact that he did the same thing with her and tried to push her away in the fourth grade because he couldn't trust their friendship, but lucky for him, Coop wouldn't budge. Now he has the best friend a person could possibly have in their corner. Poor Coop! She gets jerked around by her parents, but since she ends up with her emancipation papers, is she putting her parents behind her? Or will they still pop up in her life moving forward? Will we see Patience (Chelsea Tavares) again soon? Coop has a very complicated relationship with her parents, and while she would like to think she can just put them behind her, that will be easier said than done. And yes, we will definitely see Patience again soon. We love Coop and Patience together. What's next for Asher (Cody Christian)? He seems like he's burned a lot of bridges — for good reason. Will he catch a break soon? Asher is still dealing with his own family problems — don't forget, both mom and dad have abandoned him now — but the gang is rallying around him. In this episode, we see the start of an unlikely friendship between Spencer and Asher. And in a crazy way, they will be good for each other. However, Asher is probably his own worst enemy and sometimes has a hard time getting out of his own way. Billy tells Laura (Karimah Westbrook) about switching out Jordan’s urine sample. Since Jordan overheard this, how soon before all that blows up? While Billy did it to help his son, we'll see that Jordan has mixed feelings about that type of "help." This will play a big role in Jordan's journey over these last four episodes of Season 1, leaving Jordan and Billy in a place neither of them ever expected.